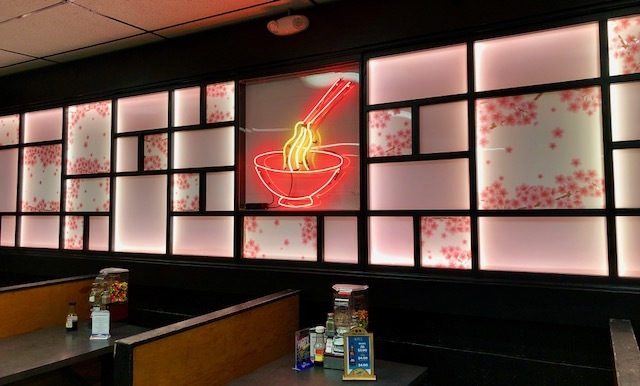 the best saimin in town! In 1983 BethAn Gilbert now Nishijima packed up and moved to Hilo from Honolulu. It took a year just to start Nori's up because of doing everything the hard way and only a small loan to start off with. Today Nori's has been around the block several times and has made it to the 30 year marker. The menu has expanded through the years and adding on to the list of items,Nori's began a omiyage list (GIFTS OF ALOHA). Our famous chocolate mochi cake which has the best chocolate and is gluten free is still the best seller. It's cousin the chocolate mochi cookies also gluten free beat out godivas chocolate one year for valentines day selection. We also have furikake cookies, teri tako, beef jerky, seasoned iriko and a bunch of other items that we make ourselves. Nori's became popular when it aired on Hari's Kitchen since then the community events, several other local shows and the 2 Skinny Chefs has kept Nori's in the know. When you visit Nori's, after eating check out the omiyage shop next door we haveNori's products available and we sell Hello Kitty items. We also have Mountain Apple Brand Products at KTA, our instant saimin, Nori's Mustard Cabbage Koko, Shrimp Krackas and our Eurasia Dressings. Consuming raw or under cooked foods may increase your risk of food born illness. with lots of convenient parking! Click on image to go to Google Maps. Nori burger special and sandwiches come with lettuce, tomatoes, onions and Nori's special sauce and a choice of macaroni or tossed salad. Special: Make any bowl of noodles a 'Special' for $1.95. Comes with a chicken stick and added cooked vegetables. Comes with won tons, 1 chicken stick and 1 barbecue stick and lots of noodles. Somen noodles cold vegetables. Kimchee & Nori's hotsauce. A mini saimin, chicken and small drink. For children under age 12. No take out.